So: turning 64 next week and what models do I have? Look no further, this is it. I already have the pearls and mart. I considered other women of substance: Madeline Albright (cannot speak Czech, not enough brooches), Margaret Mead (a little austere), June Callwood (a saint, enough said). But I settled on a fictional character, upon whom I can project qualities that support the glide into the milestone 65th year: verve, courage, glamour (relative to one's tastes), a tart tongue but a warm heart, and a firm grasp of the importance of fun. As Mame says, "Live! Life's a banquet and most poor suckers are starving to death!" What do you wear on your 64th? "Hurry my tray, darling. Your auntie needs fuel." Why spend the last birthday before Official Senior Status in anything that remotely looks like you'd stick an AARP card in the pocket? 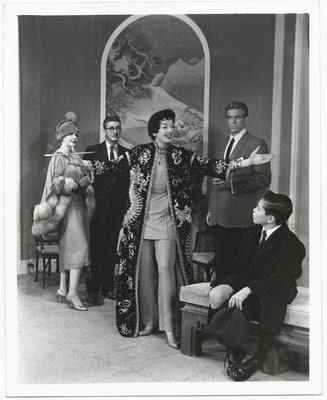 I say, time for a caftan, retro refuge of the formerly svelte. My GF Vicky, who has a couple of years on me, has worn them for decades; she habitually receives dinner guests in canary silk splashed with a handpainted orchid or fuchsia-and-lime embroidered fine cotton, barefoot, wearing a huge emerald cocktail ring (and holding a huge cocktail). Then she serves an almighty cous-cous royale without obvious effort. Vicky is house-buying Thailand now (talk about a Mame type!) and promises to send one, but, eager and facing 30+C temps here, I might order from East, the British merchant of Asian-influenced designs. 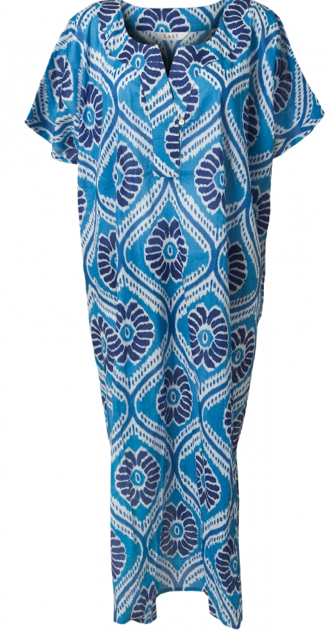 I like the colours and price of this blue ikat, £35. The silk ibis print by Mara Hoffman is splendid. Price, £292 at Matches. With a pair of light pants, striking enough for an afternoon wedding or evening dinner party. Many diversions beckon for July through August. I'll return to French immersion class, finally sift through a coin collection I inherited, and resurrect my Indonesian pork fondue recipe now that salt is not the demon we were told, and welcome many visitors. Yes, a retro summer, during which the Passage will close. This is the last post until after Labour Day or sometime beyond. I'll be thinking of you and anticipate your return. In the meantime, there are many delicious blogs to enjoy with your glass of pink lemonade or a nice restorative mojito. 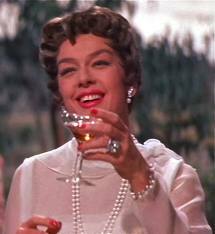 Many Happy Returns, in my book thee is no greater role model than Aunt Mame, enjoy kaftans and cocktails on the big day! Happy Birthday, and have a lovely summer. I can picture you in a caftan, tall and elegant, but I'm not so sure my short self could pull it off! It would be a cool option around the house perhaps. Happy birthday. I am with you on the kaftans I have taken to them in a big way. Happy Birthday!! Gorgeous caftans, and Auntie Mame is indeed a fine role model. Enjoy your time off, and I'll look forward to "seeing" you again in the fall. Have a wonderful birthday, your post helped me as I'm anticipating my own 60th in a few weeks. I've decided to follow suit and glide in gracefully. 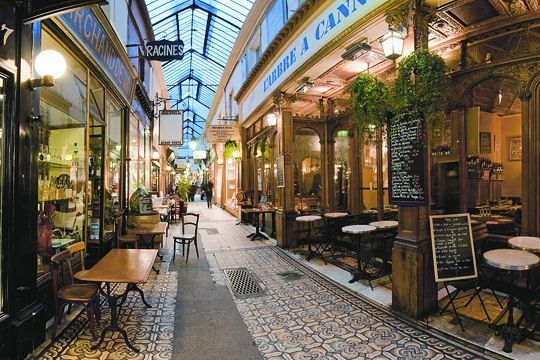 Enjoy the caftans and cocktails, coins and French! Have a fabulous Birthday and enjoy your blogging free summer! And thanks for adding to my repertoire of rhyming menagerie au revoirs. . . Nola will like this one! Happy birthday and a glorious summer, kaftans and all! Happy Birthday! 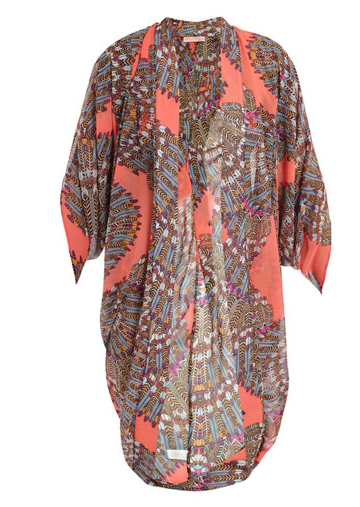 Kaftans were made for gorgeous broads like you, with your imposing height and big personality. Wear them and drink those cocktails in good health! P.S. I bought those lavender pearls, and I'm so glad I did! You have a great eye -- I'll send you a picture one of these days. Have a wonderful holiday and a very happy birthday! I have loved Mame since I was a girl - we should all have such verve and style. 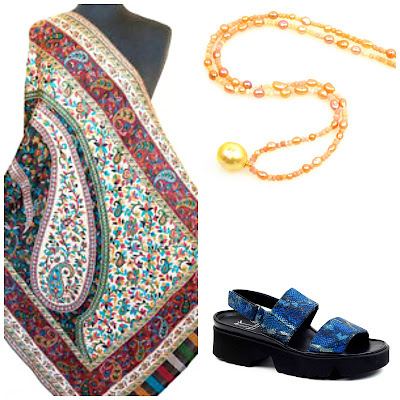 What fun to embrace the retro - you have found some beautiful examples to wear and I imagine you will be wonderfully elegant. I go weak in the knees for a good textile (oh - that Pucci!) 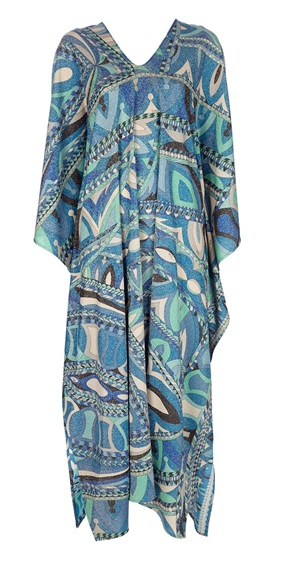 and a caftan is such a gorgeous way to show off and feel totally at ease. Good health to you! Can't wait to hear the tales you'll have in September. Oh no! Will miss you, but I'm sure you will enjoy your summer....sounds fab. Yes to Mame, yes to caftans. I'm about nine years behind you, but pondering the same issues re: what kind of person am I going to be in my "later middle age"? Trying to get a handle on it by next year, when my youngest goes off to college. It will be an entirely new chapter in my life, and I'm not quite sure what to do with it! Also realize how lucky I am to have so many choices. As I live in a very hot climate, I love the caftan; in a thin printed cotton, it's covered up but cool, and you can wear very little underneath! I have a short Lilly Pulitzer I quite love. Oh, and I'm still fantasizing about your emerald ring. Want!!!!! Happy Birthday and have a great rest of the summer. Your blog will be missed! 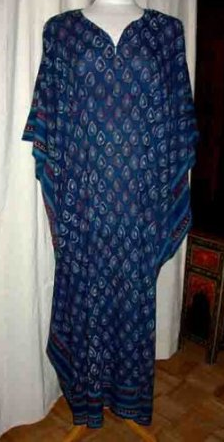 Artful: You might check eBay, there are several sellers of new Anokhi stock, including kaftans. Instead of a caftan, I'll be wearing white jeans and a fabulously expensive t-shirt. And a resounding yes to Aunt Mame. I agree that she is a great role model, and I've always hoped to have some of her verve when I grow up. It sounds like you have good plans for your blogging break. Enjoy your summer and have fun. Happy Birthday, Duchesse! You are such an inspiration to me and I'm so glad I have met you. Thank you for all your wonderful posts. I hope you enjoy the summer, and can't wait to see you again after Labor Day! I will miss you! P.S. My darling sisters just sent me some cute clothes for work from Doncaster/Tanner in North Carolina. We go there every 4th of July and I missed it this year so they sent me the same things they got. Aren't we funny?! Happy birthday. I love someone who tells their age. hard enough. Enjoy you time off. Your caftans are divine. 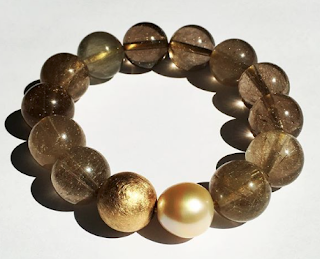 I can just see you in one with some of your jewels and signature joie de vivre. I hope you do something special that includes a cocktail. Intensive French lessons? Yikes, you'll be able to speak using complex verbs unlike someone we know. . .
A belated Happy Birthday, and best wishes for a wonderful summer!! Looking forward to your return in September. PS. I have given your blog the "One Lovely Award" blog!! I really enjoy your blog - thanks for the great posts! Happy Birthday, lady! Wishing you a magickal 64th. Bella Q: You are far younger than the intended audience for this blog. Thanks for your wishes.